The key to successfully fighting cancer is early detection. Cancer symptoms can share the characteristics of other conditions, so proper testing by doctors is essential. 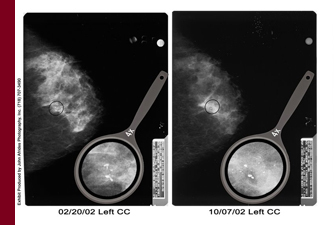 Tests such as the PSA test, mammograms and biopsies are commonly used by the medical profession to detect cancer. Many times doctors fail to even order these crucial tests. There are also situations where the proper tests are ordered, but the radiologist misreads the film or the pathologist misreads the slide, leading to a crucial delay in making the diagnosis. Delay in diagnosing cancer can worsen the treatment or prognosis or can even be fatal. On January 31, 2018, New York enacted “Lavern’s Law,” changing the way the statute of limitations is calculated for medical malpractice cases involving the failure to timely diagnose and treat cancer. 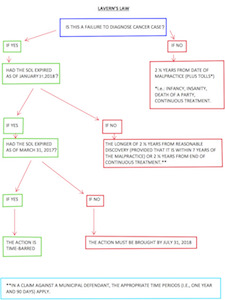 For just this class of cases, the statute of limitations now begins to run upon reasonable discovery by plaintiff that he/she has been a victim of malpractice; the plaintiff has 2 ½ years from that point, or 2 ½ years from the last date of treatment where there is continuous treatment (whichever is longer) to bring the action, provided that the action is started within 7 years of the malpractice. For cases against municipalities, claimants now have 90 days from reasonable discovery to file a Notice of Claim (no motion for late notice would be necessary), but the 7 year outside limit still exists. All of the above applies to acts of malpractice going forward or for acts of malpractice for which the statute had not had yet expired as of the effective date of the statute, January 31, 2018. If the statute first expired on March 31, 2017 or later, the cause of action is revived and must be brought by July 31, 2018. Where the statute expired prior to 3/31/17, the action remains time-barred. Our team of attorneys includes a board-certified physician and a professional registered nurse who can assist in reviewing your case and help you to understand the full medical scope of your claim. Our firm conducts exhaustive investigations, and we retain the most qualified experts to bring a comprehensive level of expertise to surpass that on the other side. For example, when a doctor fails to diagnose breast cancer, we seek out and retain a practicing breast cancer specialist to determine the full circumstances of the misdiagnosis and in the event of a misread mammogram, we will find an expert radiologist to examine the films. If your cancer went undiagnosed by a doctor or was misdiagnosed, please contact our firm to discuss your case. $2,300,000 settlement in a medical malpractice case on behalf of a woman whose doctors failed to timely diagnose her breast cancer. $1,950,000 settlement for a man in a medical malpractice case stemming from the doctor's failure to diagnose bladder cancer. $1,900,000 settlement for a New York man in a medical malpractice case stemming from the doctor's failure to diagnose endometrial cancer.